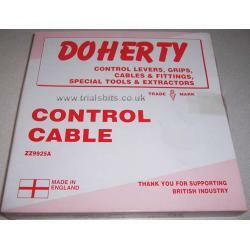 A genuine Doherty front brake cable for the t20 Tiger Cub models from 1965 onwards. Comes with the adjuster and clevis. The outer length is 29 inches and the inner length is 34 inches. Equivalent to original part number 60-0505 or D505. Made in the UK, and supplied in the Doherty box, which might be tatty and / or faded.